The tables present SSI data by eligibility category (aged, blind, and disabled) and age. State data on the number of recipients and amount of payments are shown in Tables 1 and 2, respectively. 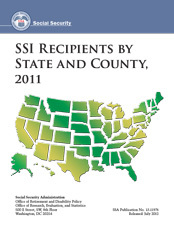 SSI recipients who also receive Social Security (Old-Age, Survivors, and Disability Insurance) benefits are shown in Table 1 and in Table 3, which presents data at the county level. Diane Wallace in the Division of Retirement, Survivors, and Disability Insurance Statistics and Analysis programmed and compiled the data for this report. Staff of the Division of Information Resources edited the report and prepared the web version for publication.